There is one thing I love most of all about the start of summer. Is it the fact that the sun makes everyone miraculously willing to share picnic tables with complete strangers? No. Scantily clad men stirring jugs of Pimms whilst practising their best Mr Darcy wet-shirt pose? Not even. It's the BERRIES. Finally, berries are edging their way back into season. Hooray! Time to celebrate by combining them with sticky booze into a fruity, sticky, booze cake. Oh no! Mr Darcy, you seem to have stained your white shirt with blackberry cake. Pass it here. You don't need it anyway. 100g fresh blackberries (you can use frozen as well, or replace with raspberries or mixed berries, as you prefer). 2 tbsp caster sugar (I used vanilla sugar: stick a used vanilla pod in a pot with some caster sugar and leave it for a bit. Hey presto). Pre-heat your oven to 180C/350F/Gas mark 4. Grease and line a 450g / 1lb loaf tin. Place the chopped hazelnuts in a dry pan and toast over a low heat for around 2 minutes. (Watch out, they catch and burn very easily). Tip onto a plate to cool. Beat the eggs, then add to the butter along with the flour and almonds. Stir to combine, but don't over mix. Gently stir in the cooled hazelnuts. Tip into the loaf tin (you've probably already got one handy after working your way through these top ten loaf cake recipes) and smooth over the top. Bake for 45 minutes until risen and golden brown and a skewer comes out nearly clean. Place 100g blackberries into a saucepan, along with 4 tbsp sloe gin and the sugar. (Save a few whole berries for decoration and / or surreptitious eating). Stir together and cook over a low heat until the blackberries can be crushed with the back of a spoon and the liquid has reduced, about 10 minutes. Place a mesh sieve over a bowl and strain the liquid, smooshing the berry-pulp with a spoon to get all the juicy amazingness out. Return the clear liquid to the pan and reduce over a low heat again until thickened, another 4-5 minutes or so. Set aside and stir regularly: you'll want to use this quite quickly before it sets, so have that cake ready. Prick holes in the top of the cake whilst still warm and pour over the remaining 1 tbsp of sloe gin. Remove from the paper and place on a wire rack. (You might want something underneath - this bit gets messy). 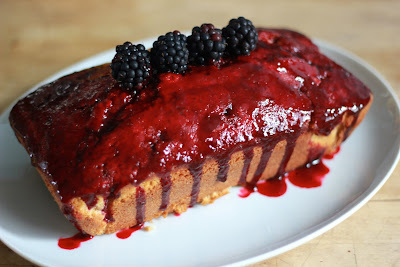 Spoon the glaze over the cake whilst still warm, pushing to the edges with the back of a spoon. Decorate with the remaining blackberries and bask in the ruby, sticky deliciousness that has now stained your entire kitchen. There doesn't seem to be enough gin here...don't forget the 50ml for the double g & t you need to drink with it!! !